The biggest park in the city and the second biggest in the country Nanhu Park, also known as South Lake Park offers a beautiful retreat from the bustling city life. 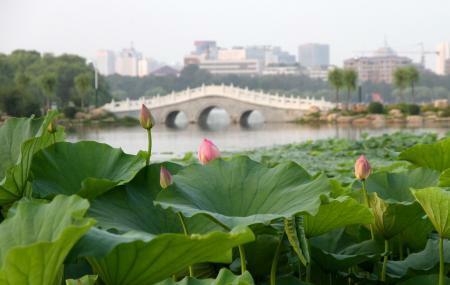 Built in 1933 the park covers an area of 220hectares with lakes, trees, pavilions and bridges. One of the reasons for it being the most preferred park in Changchun is the wide range of activities it offers. There’s a small amusement park inside, there’s also the option of renting boats in summer to go for boating or fishing in the lake. Winter comes with its own set of fun filled activities like skiing, skating, riding dogsleds pulled by camels. It is also the place where there’s an Ice lantern & sculpture show during the winter which is sure to delight you. By Bus: No. 62, 13 or 25. How popular is South Lake Park? People normally club together Zoological And Botanical Garden Of Changchun and World Sculpture Park while planning their visit to South Lake Park.